So many of our memories revolve around food. Thanksgiving is coming up, followed by Christmas and the New Year. Food is an important part of those celebrations. Just the other day, I wrote about how an ordinary night our for supper turned into a special memory for no particular reason. Food evokes memories – from its taste, odors, the actions of the cooking itself. There are so many reasons for it. Food represents traditions extended through the generations, such as the gathering of the family for the holidays. My paternal relations got together for every holiday and usually invited the other side of the family to come also. That’s why I know my cousin’s other grandparents and they knew my maternal grandmother (hence my joke that I thought everyone’s grandparents spoke with a thick German accent). That was one of the traditions of the meal together. Another was my paternal grandmother and her sister doing all the cooking, so my grandfather could carve the meat and show off “his” wonderful meal. Food can be a ritual that signals a special event. My husband and I gave up on going out for Valentine’s Day due to how expensive and mediocre the meals were. Now I leave work a little early and together, we fix a nice meal for ourselves using expensive ingredients that we never shop for otherwise. The year we made filet mignon, we had to spend some time looking up how to cook it as in all the years we were married, we’d never cooked it at home! Valentine’s Day revolves around a nice meal, whether going on or staying home. Food also brings comfort and it evokes comfort. I love the smell of the house when we bake winter squash or make a pot of lentil soup. The kitchen is warm, comfortable, and inviting. I can sit and relax, eat slowly, and savor the taste. Food can also be part of fun. My memories of going to Wrigley Field also includes the hot dogs, Cracker Jack, and peanuts. When my husband and I were dating, he was hungry all the time – of course, what else did you expect from a teenage boy? We frequently went bowling and then out for pizza, hamburgers or tacos, all of which were cheap for a date. Food doesn’t have to be complicated to be enjoyable. Although I love elaborate meals, I don’t enjoy cooking them any longer. It’s too much time and effort and the time to eat goes too fast. A simple pan of baked chicken breasts, baked potatoes, and some pan fried cabbage make for a wonderful meal with minimal effort. Soups can take a while to prepare by the time everything gets cut up, sauteed, and cooked. But a pot of soup can make for multiple meals and is worth the effort. A good article on making food memories can be found here. For the perspective on food memories from another author, check out this article. 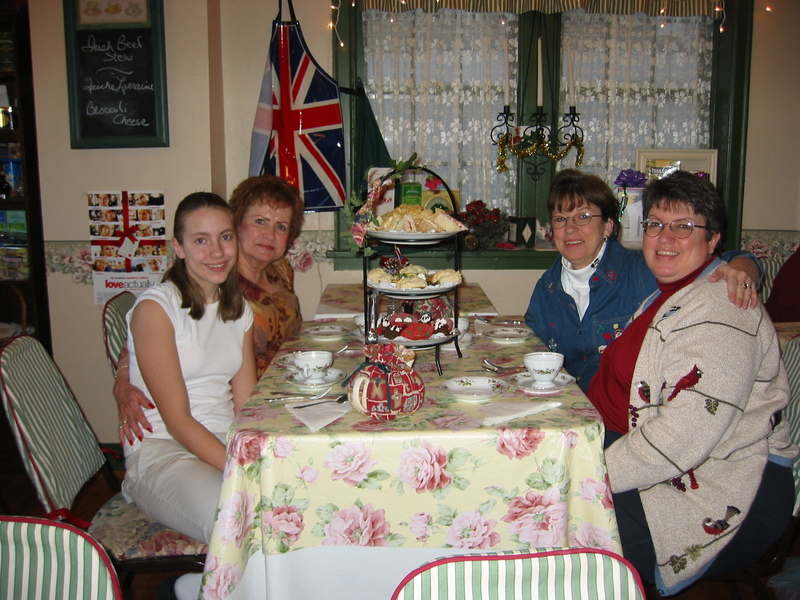 Here I am, out with my mother, sister and niece, out for high tea as we get ready to gobble up those yummy treats that were just put in front of us. It was a wonderful day after Christmas treat and visit, a special event that we remember with fondness. Word for tomorrow – AUTHOR. If you prefer to work ahead, see the list for the week under “A Word A Day”. Oh no, that’s not rude at all! I do it all the time and most bloggers love to see links that mirror their topics. I loved the description of how your Dad got you back for being greedy that day – too funny – now of course, not then. I’m glad I ate dinner before reading this, I would have likely starved thinking of all those wonderful foods. Now ya’ know – gotta eat before reading my blog!